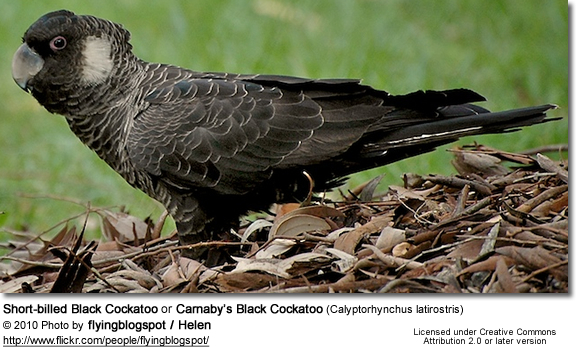 The Short-billed Black Cockatoos or Carnaby's Black Cockatoos (Calyptorhynchus latirostris) are also known as the Large Black Cockatoos, or simply Carnaby's Cockatoos. The Short-billed Black Cockatoo averages about 55 cm (21.5 in) long. The plumate is mostly dark-grey or black with narrow vague light-grey scalloping, which is produced by narrow pale-grey margins at the tip of dark-grey feathers. It has white cheek patches. It has a crest of short feathers on its head, and it has whitish patches of feathers that cover its ears. Its lateral tail feathers are white with black tips, and the central tail feathers are all black. The irises are dark brown and the legs are brown-grey. 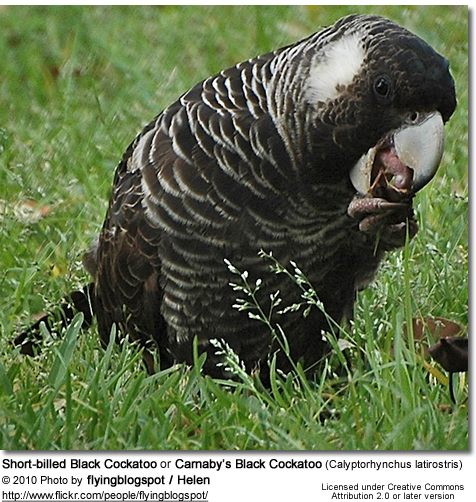 Its beak is shorter and broader than that of the Long-billed Black Cockatoo. The adult male has pink-red rings around the eyes, and off-white cheek patches. They have dark grey beak and pink eye-rings. The adult female has dark grey eye-rings and bright white cheek patches. Her beak is bone or horn-colored. Her ear patches are paler than that of the male. Juveniles have bone or horn-colored beaks, grey eye-rings, and have less white in the tail feathers. This cockatoo is endemic to south-western Australia; where it is considered endangered under the federal Environment Protection and Conservation Act 1999, and as Schedule 1 "fauna that is rare or is likely to become extinct" by Western Australia's Wildlife Conservation (Specially Protected Fauna) Notice 2008(2) under the Wildlife Conservation Act 1950. The population size of Carnaby's Cockatoo has fallen by more than 50% over the last 45 years. They feed on seeds of plants, such as Banksia, Hakea, Grevillea, Eucalyptus, Corymbia and Pinus. They also take invertebrates such as the larvae of wood-boring moths. They are often seen sitting in trees cracking the seed pods or cones. Their preferred breeding areas are the Wandoo and salmon gum woodlands. There they are competing for nesting places with invasive species, such as the Western Long-billed Corella, the Galah, and even the European honeybee. As this species is rare and at risk of extinction, every effort should be made to place any eligible captive carnaby cockatoos into a well-managed breeding program to ensure their survival. If individuals of this species are not good prospects for breeding for whatever reason and you are considering it as a pet, the following should be of interest.